I have my favourite chocolate cake recipe, and despite having tried multiple other recipes since then, I still go back to it as my number one. So these days, the purpose of my trying out other chocolate cake recipes isn’t to try to find a better one, it really is just to try different ones. I tried one this weekend that I quite enjoyed, and so have decided to share it with you guys. The problem is, I wrote this recipe down over a year ago in my tattered recipe book, and can’t remember where I got it from. It was when I was going through my salted caramel phase (thanks to Tat Wei and his Forty Licks ice-cream), so was definitely quite a while ago. If anyone knows where this recipe is from, please leave a message and I’ll give give credit where credit is due. Cos seriously, this was a fun cake to bake. We celebrated Chinese New Year and were given a fantastic four-day weekend, so I had some time to try it out. Also, the siblings are all out of the country and my parents were away for a wedding… and you all know how much I love experimenting with messy, complicated recipes with multiple components when I have the house to myself. Place a cake layer on your cake plate, pour the salted caramel filling over the layer and let it soak, then top with the chocolate ganache, sprinkle a tsp of sea salt flakes and cover with the next layer. Repeat, then coat the cake with a crumb coat of ganache and put the cake in the fridge to solidify for around 30 minutes. 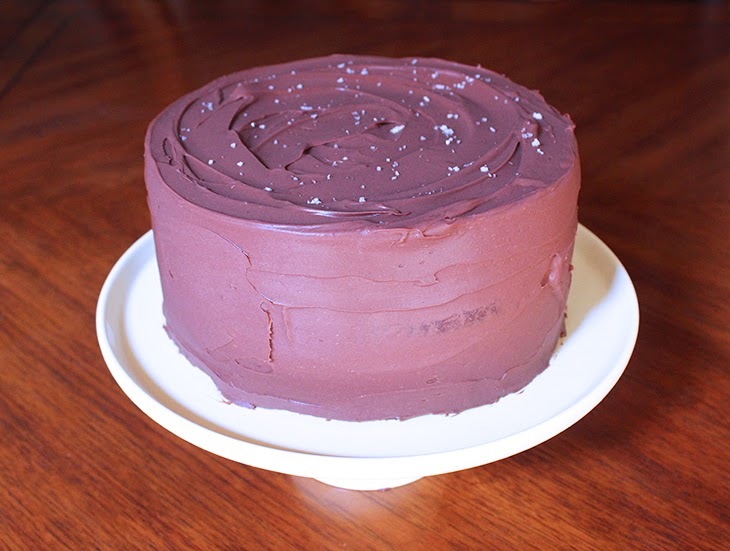 Then finish coating the cake with another layer of ganache, and sprinkle the top with sea salt flakes. I found this cake a little TOO sweet for my liking, and I think it’s the amount of sugar in the ganache. I generally don’t add that much sugar to my chocolate ganache, preferring a darker and more bitter frosting. I think in future, I’ll go back to a simple chocolate ganache and content myself with salted caramel filling. 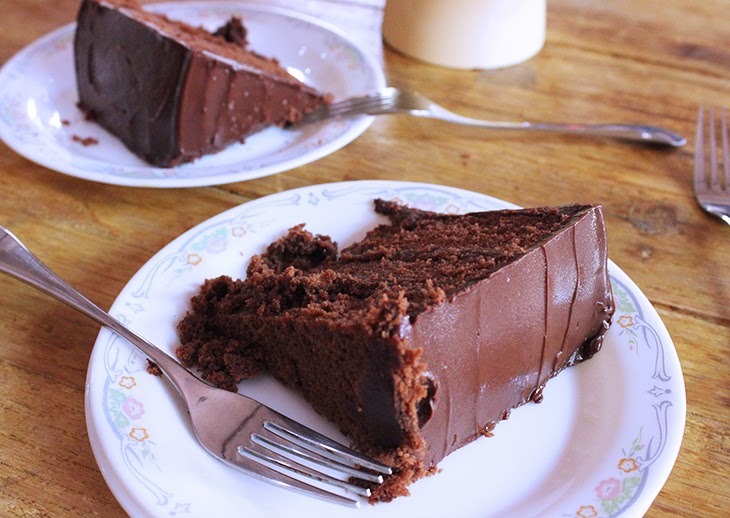 The cake texture is incredibly moist and dense, and I think if served with a simple coating of dark chocolate ganache and drizzle of salted caramel, would be quite perfect.